In 1993, Nike aired the (in)famous Charles Barkley “I Am Not A Role Model” commercial. It sparked a debate. Could high-paid professional athletes choose to be role models? Or were they role models because of their high profile positions, whether they liked it or not? I am not the solution to performance gaps. I am not paid to be the solution to performance gaps. I am paid to create amazing learning experiences that show employees what is possible. Managers should be the solution to performance gaps. Just because I score 5 out of 5 on an evaluation doesn’t mean I will solve your employees’ problems. In the absence of Nike turning this into a commercial and then a national debate, feel free to start your own debate in the comments section. Do you think training professionals are the solution to performance gaps? Templates are wonderful and the web is loaded with examples that you can download and begin using today. After staring at the latest “Free Lesson Plan Template” you may start to wonder, what am I supposed to do with this? While we cover some more advanced issues about designing versus delivering in Training Lesson Plan Templates: Design vs. Delivery, this article is dedicated to helping you effectively use each component of the lesson plan for adult learners. This post is an attempt to rectify that situation. Download the lesson plan for adults template or the Design vs. Delivery template. 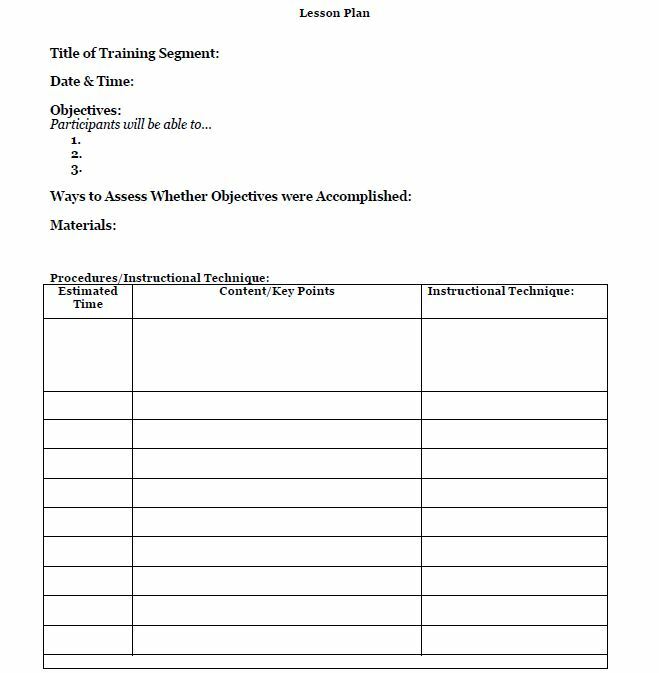 What is in a Lesson Plan Template? This is a simple field, where the name of the segment can be as plain as “Advanced Sales Training Techniques” or it could be something more creative like “To Train or Not to Train: Why Not Training is Sometimes the Best Training Intervention”. While the lesson plan is generally for your eyes only, a catchier title can help steer traffic to your presentation if you’ll be facilitating a workshop at a conference. Sometimes you’ll design a presentation for a specific day and time, and if you’re offering multiple workshops during a trip, this field can help you keep track of which presentation you’ll be facilitating on which day and at which time. Sometimes you’ll design a lesson plan that will be used over and over again, and you may wish to simply enter “90 minutes” into this field. Keep in mind that this template is designed to provide structure to your presentations, but should be adapted to best meet your needs. COMPLETE THIS SECTION PRIOR TO ANY OTHER PLANNING YOU DO IN YOUR LESSON PLAN FOR ADULT LEARNERS. This section is intended for you to design learner-centered, action-oriented objectives. Put differently, what should your learners be able to do by the time you’re finished with your session… and how will you, as the facilitator, know that your learners have accomplished this objective? Well-crafted learning objectives will basically write your lesson plan for you. Do you want your learners to be able to explain a concept? Then be sure to make room in your lesson plan for an activity that allows your learners to actually explain the concept. Want them to demonstrate something? Then you may need to design an activity that involves role-playing or some other simulation of a skill. As I alluded to earlier, you want to design activities by which you, the facilitator, can determine whether or not your learners are able to do what you set out to teach them. Going back to your traditional school days, some make call this a “test”. And a paper-and-pencil, multiple-choice exam is indeed one way to assess whether or not the learners get it. Take a look at the verbs you’ve used in your objectives, and then be sure to craft an activity that allows your learners to demonstrate those verbs. If you have a learning objective such as “by the end of this presentation, learners will be able to demonstrate the five phases of coaching,” then you’ll need to have an activity in which the learners can show off the coaching skills they’ve learned. And you may wish to have an observation rubric to provide feedback (or even to provide a score) on the skill your learners have attempted to demonstrate. Do you need blank flipchart? Markers? 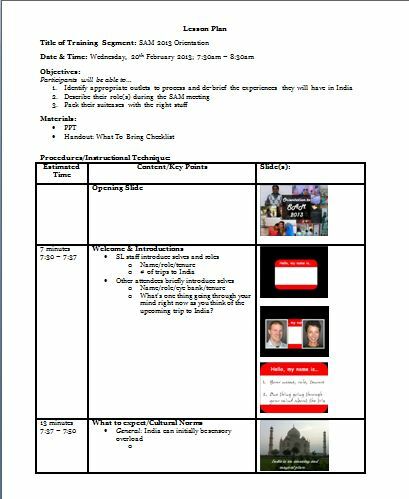 Are you going to prepare flipchart prior to the session? A PowerPoint presentation? Handouts? Sticky Notes? Tape? Name tags? Name tents? Be very specific about the materials you’ll need and when you’ll need them. In the event you’re in a hurry to get to the training room, a complete list of materials you’ll need can be a very good reminder for you. Showing up unprepared for a session is a good way to lose credibility with your learners. It’s helpful to break your session down into smaller segments in order to be sure to keep a good pace and to keep on time during your presentation. How much time do you want to devote to the welcome/introduction? Icebreaking activities can be fun, but if you don’t have a plan, they can run way over time, which means you’ll be playing catch up for the rest of your presentation. How much time do you want to allow to introduce a topic? How much time should your learners have to practice a given skill? Don’t forget to leave time to wrap up and tie everything together. Here is where you want to describe, in some detail, how each section of your lesson plan should be facilitated. While it’s not necessary to write a verbatim script, it may be helpful to be fairly specific in your instructions. If you have to give this same presentation a year from now, you’ll be happy you took the time to write out specific instructions for each section. And if you’re stuck in traffic and need a co-worker to cover for you, they’ll need a fairly detailed explanation of how to facilitate your activities. Here you should simply describe how you plan to deliver your content. Will you use some lecture? Small group activities? Large group de-brief? Role play? Simulation? Will you show a video? When you describe how you plan to deliver your content, you’ll be able to see, at a glance, whether your lesson plan would appeal to auditory learners (lecture, discussion, listen to recording), visual learners (use of visual aids, flip charts, handouts, video) and kinesthetic learners (simulations, role plays, gallery walks). 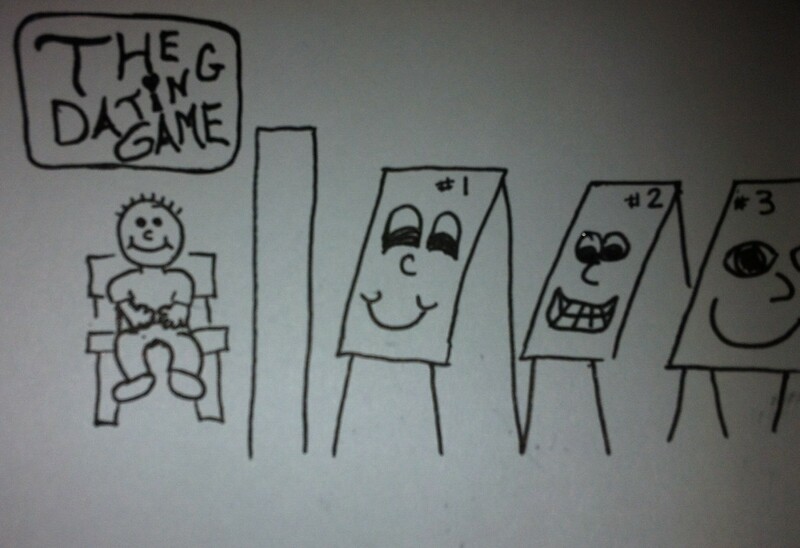 If each instructional technique field relies too much on one technique (such as lecture), you run the risk of a monotonous, boring presentation. Are you using a different lesson plan for adult learners? and thereto I pledge thee my partner in learning. One of the best ways I know how to prepare for a presentation is through a well-designed lesson plan. But even the most creative, instructionally sound presentations can quickly get derailed if the presenter forgot to bring an important material or if a piece of equipment just wasn’t set up in time. The training materials checklist could prove helpful in day-of-presentation preparation. On the day of a training workshop, I know there can be a lot of things happening – meetings, phone calls, emails, other project deadlines. I’ve found having a training materials checklist can help remove my anxiety around being certain I have everything I need as I head into the training room. What if You Have Materials to Print? 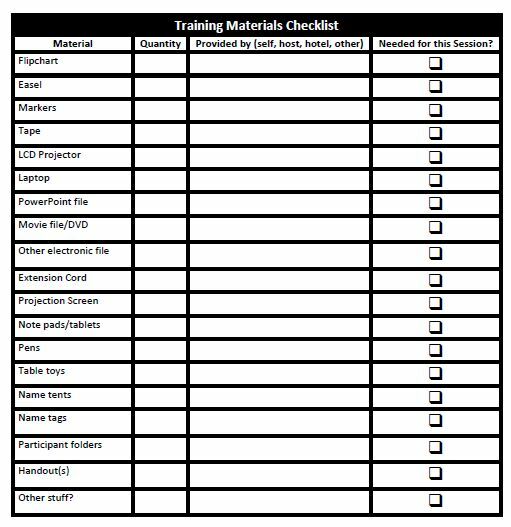 At Endurance Learning, we often create custom training sessions that use a training materials checklist for each day. Instead of hunting through the materials to know when you use something, how much of it you use and how to print it, we create these as checklists in the printed Facilitator Guides and as Word documents that the facilitators can use as an order sheet. They can copy the contents of the order sheet directly into email and send the files to the printer. Voila! When you add this to the materials list, you know that you have everything you need and in the format you need it. Is there anything missing from the training materials checklist? Drop me a line in the comments section. Are you headed off to a conference? Or perhaps you’re a supervisor who’s sent a staff member to a workshop. The following, simple graphic organizer is designed to assist you (or your direct report) in transferring the learning from the classroom to the workplace. 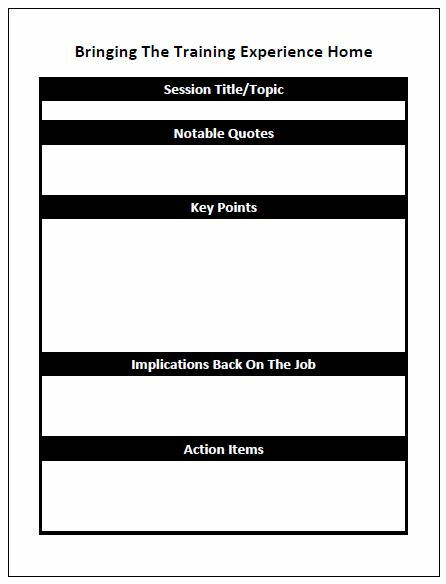 This is how I used the template when I recently attended the SHRM Talent Management conference. Obviously, this is just a template. You may want to modify it, take something out, or perhaps add an additional field (maybe adding a field to the top such as: “What I want to take away from this session”). The key is to keep it simple. Put too many fields in and it becomes tedious to fill out. Remove too many fields and it may not be useful in transferring the learning to the realities of the workspace. Give it a whirl (or if you’re a manager, give it to a direct report that will be attending a training session), see if this simple tool can help increase the return you realize the next time you invest in professional development. As I took a seat at the gate in the Las Vegas airport, I noticed another passenger making a PowerPoint presentation. It had a lot of text. A lot. I came very close to asking her if I could give her a little feedback. The next day, I found myself needing some slides from a presentation I had missed. I hoped the slides would have a lot of text so I could figure out what the presentation was about. Could I be a hypocrite on this issue? It made me do some soul-searching. The slides from the presentation I missed were quite helpful. There were statistics and formulas to calculate various metrics. It was like the CliffsNotes version of the presentation. I got the jist of it without needing to attend the session. Without needing to attend the session. I didn’t have to attend the session. I didn’t have to spend 75 minutes of my life in that session. I didn’t have to pay $1500 to attend the conference (plus $600 in airfare and hotel costs, plus meals). The best presentations I’ve ever seen are the ones where the slides complement the presentation, like back-up singers providing harmony to an amazing vocalist. These presentations have slides that include one mindblowing statistic, or a funny image (and no text). What do you think? What role should slides play? How much text is too much? The Train Like A Champion Blog is published Mondays, Wednesdays and Fridays. If you think someone else might find this interesting, please pass it along. If you don’t want to miss a single, brilliant post, be sure to click “Follow”! Me: Presentation #1, when I’m at a conference, I generally have high hopes for the quality of a presentation, but I also have low expectations. What would you do to fulfill my hopes and exceed my expectations? Presentation #1: Well, I’d begin by describing my presentation as “interactive” in the conference program. Since we’re in Vegas, I’d double down by telling you how interactive the presentation will be as we get started. And I’d make sure you felt welcome to ask questions at any time. I’d tell stories based on my experiences and I’d ask the audience questions from time to time. Me: Hmmmm, I guess that’s a conventional way to look at interactivity. Presentation #2, we are in Vegas and there’s a lot going on. What would make you stand out? Presentation #2: As soon as you walk through the door, I’d not only welcome you, but I’d make sure we connect personally. I’d bring up our common Pacific Northwest roots. Even though the audience will be standing room only, I want you to feel like I’m talking to you. I’ll give you two specific pieces of homework I’d like you to do as soon as you get back home. And I’ll show a video clip of an iPhone getting blended up. Oh, you’ll remember me all right. Me: An iPhone getting blended up?! I’m intrigued. Presentation #3, my time is valuable to me and I’m needy. I need to be engaged. How would you propose to engage me? Me: Ok. That’s true, I do rock. Now what? Presentation #3: I’m going to engage you by getting you involved. Maybe you’ll stand and give high five’s. Maybe you’ll be asked to write some answers to my questions. Maybe you’ll be instructed to talk with some people around you. Maybe you’ll be asked to share some thoughts with the entire crowd. Maybe I’ll build upon your other experiences at the conference by telling you how the information from the keynote speaker you just heard affirms and complements my own content. Maybe I’ll end with a call to action. Maybe I’ll provide some specific steps you can take. Me: Sounds amazing. One last question for all of you. I’ll start with Presentation #3. Looks matter to me. What do you look like? Presentation #3: I come dressed in slides. Custom made slides. I try to economize on words, and occasionally I’ll use bullet points. But I have the most fun when I can be whimsical – when I use a picture instead of a thousand words. Me: You sound cute. How about you, Presentation #2? Presentation #2: I dress pretty skimpily… in a good way. If I wanted you to read a lot, I’d just give you a book. So I don’t wear many words. But if you’re into sticky images, I can show you a giant piece of construction equipment that crushes a truck. I can show you a triangular model to help connect your values, passions and delivery methods. I don’t wear much, but I bet you’ll take notes on what you see and hear! Me: Wow, steamy! Presentation #1, the bar seems to have been set high. What do you look like? Presentation #1: I like consistency, so my slides align with the conference template. I respect visual learners, and I make sure to include main topics and bulleted lists. And clip art. But keep in mind, it’s what’s inside that counts. And I’m a charismatic speaker. Me: It’s time to make my decision. I think all three of you are smart and talented and I really appreciate you bringing your gifts of knowledge and experience to the conference. It’s a lot of work preparing for something like this and it’s always a risk to be in front of people. This is a tough decision. Presentation #1, I learned some things from you, but when it comes to design and delivery, you might want to take a few more risks and try some new things – both in terms of visual aids (your “looks”) and your “interactivity”. We won’t be seeing each other again. It really comes down to Presentation #2 and Presentation #3. The truth is, you’re both amazing. My decision, the presentation that I truly fell in love with is… Presentation #2 (whose true identity is Todd Hudson’s “Unforgettable Onboarding”). And since this is my game and my rules, I also choose to fall in love with Presentation #3 (Jason Lauritsen’s “The Future of Talent Management”). The Train Like A Champion Blog is published Mondays, Wednesdays and Fridays. If you think someone else might find this interesting, please pass it along. If you don’t want to miss a single, brilliant post, be sure to click “Follow” at the top of the page! Would Match.com Help Me Find The Ideal Presentation this Week? This week I’m in Las Vegas for SHRM’s Talent Management conference. This afternoon, I saw a sign for a wedding chapel in my hotel. It made me wonder: will I find a soul mate of a presentation at this conference? I’m told I have a one-track mind. All I can think about is how to make learning a great experience for the learners. Whether I’m at work, at home or on vacation. I’m hoping you’ll be ok with this little quirk. As for you, the question shouldn’t be *who* I’m looking for… more *what*? I’m really looking to be swept off my feet and smitten with a well designed and delivered presentation. If you’re good, I might even want to take you back home with me, as a kind of longer term thing. Honesty I try Honesty is a must! What you advertise in your session description should be what you deliver in your session. On Wednesday, I’ll share whether I’ve been able to find this elusive soul mate. In the mean time, what kinds of things do you look for in a conference session? I’d love to hear from you in the comment section. When we ask someone without a training background – perhaps a subject matter expert or a colleague with a particular set of skills or experience – to present to a group, how can we set them up for success? Offering tools such as a lesson plan template or a presentation guide is a start. Offering ideas and examples of stellar visual aids can also make a big difference. If you want to take presentation preparation to the next level, however, sometimes a presenter needs some help double-checking his or her plans – does their plan include everything they’ll need in order to engage a group? 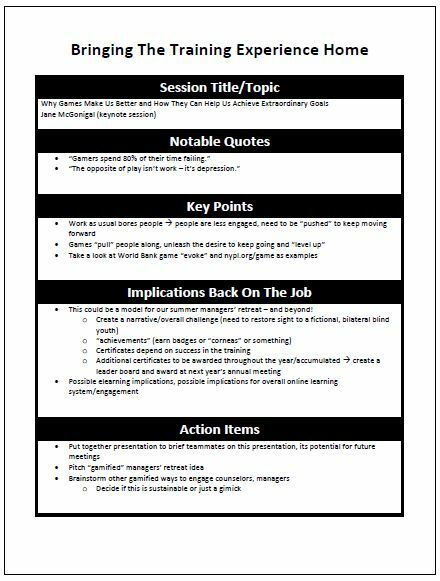 I’ve used this training checklist during train-the-trainer presentations and participants have found it extremely helpful to check over their lesson plans prior to delivering a practice lesson. I’ve also found it to be a useful tool to structure my feedback for colleagues who have asked me to look over their lessons. Have something to add to this training checklist that would help ensure a better presentation design? Let me know in the comments section. Think this tool could help someone you know with their presentation prep? Feel free to forward this post. Is Lecture the Root of all Evil? My Position is Evolving. Recently I saw my picture in a newsletter. The caption under the photo read: “Picture shows participants listening as Brian Washburn delivers a lecture.” Delivers a lecture?! I don’t lecture. I facilitate. For years I’ve crusaded against the all-lecture format. I’ve never found any research that suggests even auditory learners retain information through lecture better than through a more interactive format. How can a lecturer tell whether or not the audience gets it, let alone whether or not they’ll be able to do something better or more easily? But there’s something about some of my favorite TED talks that is compelling. And TED talks are 100% lecture. Last week in response to a post I had written, instructional designer Kirby Crider posted a link to this video. It’s 100% lecture, yet I hung on every word. I still remember some of the major points. And the speaker’s 8 minute riff on the future of gamification and how it just might be integrated into everyday life both amused and haunted me. Maybe, just maybe, it’s ok for people to come together, invest their time (and often their money) to attend a presentation without being able to do something differently. Perhaps some presentations aren’t as much about learning in the moment, but rather being introduced to a topic, being excited about a topic, being inspired to go out and discover more about that topic on your own. In the “Design Outside the Box” presentation posted above, the speaker does an amazing job offering some context and painting a picture of what might be possible. He uses a few well-placed and well-designed slides with limited text in order to illustrate his points. He doesn’t overdo it, he doesn’t rely on stale templates with lots of bullet points. He’s obviously invested significant time preparing what he wants to say. Sometimes presenters – subject matter experts, keynote speakers, employees who have been asked to address their colleagues or some other group on a topic – mistake the time and effort invested in preparing a presentation (which ends up being lecture-based with lots of slides and lots of text) with good design. Just because a presentation took 8 or 12 or 20 hours to prepare doesn’t mean it is a good or useful presentation. And herein lies what I feel gives lecture such a bad name.